This study examined the benefits and difficulties that graduate student teachers perceived while participating in online collaborative group activities during their first year of a masters program. Overall, it was discovered that the three most prominent perceived learning outcomes involved 1) the teachers' recognition of the value of a supportive learning community, 2) the teachers' belief that such practices could develop their metacognitive knowledge, and 3) the teachers' new understanding of the constructive use of online communication tools. Difficulties encountered while attempting to achieve these online collaborative tasks were found to involve 1) cognitive conflicts, 2) individual differences, 3) difficulties adapting to a nondifferentiated grading system, 4) time-zone scheduling problems and 5) the unique challenges caused by not being able to communicate face-to-face. An, H. & Kim, S. (2009). The Benefits and Limitations of Online Group Work in a Teacher Education Program. 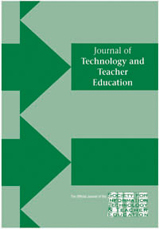 Journal of Technology and Teacher Education, 17 (2), 2465-2472. Waynesville, NC USA: Society for Information Technology & Teacher Education. Retrieved April 18, 2019 from https://www.learntechlib.org/primary/p/22803/. Alexandre, P., Schallert, D., & Hare, V. (1991). Coming to terms: how researchers in learning and literacy talk about knowledge. Review of Educational Research, 61, 315-343. Ball, D.L., & McDiarmid, G.W. (1987). Understanding how teachers’ knowledge changes. National Center for Teacher Education Colloquy, 1(1), 9-13. Brown, A.L. (1994). The advancement of learning. Educational Researcher, 23(8), 4-12. Brown, A. L. (1997). Transforming schools into communities of thinking and learning about serious matters. American Psychologist, 52, 399-413. Brown, J.S., Collins, A., & Duguid, P. (1989). Situated cognition and the culture of learning. Educational Researcher, 18(1), 3242. Bransford, J. D., Brown, A., & Cocking, R. (2000). (Eds. ), How People Learn: Mind, Brain, Experience and School, Expanded Edition. Washington, DC: National Academy Press. Bush, G. (2003). The School Buddy System: The Practice of Collaboration. ALA Editions: Chicago, 2003. Calderhead, J. & Robson, M. (1991). Images of teaching: student teachers’ early conceptions of classroom practice. Teaching and Teacher Education, 7, 1-8. Chi, M. T. (1997). Quantifying qualitative analyses of verbal data: A practical guide. The Journal of the Learning Sciences, 6(3), 271-315. Chi, M., Bassock, M., Lewis, M., Reimann,P., & Glaser, R.(1989). Self-explanations: How students study and use examples in learning to solve problems. Cognitive Science, 13, 145-182. Creswell, J. W. (1994). Research Design: Qualitative & Quantitative Approaches. London, SAGE Publications. Dirkx, J.M. & Smith, R.O. (2004). Thinking out of a bowl of spaghetti: Learning to learning in online collaborative groups. In T.S. Roberts (Ed. ), Online Collaborative Learning: Theory and Practice (pp. 132-159). Information Science Publishing: Hershey, PA.
Flavell, J. (1976). Metacognitive aspects of problem solving. In L. Resnick (Ed. ), The nature of intelligence (pp. 231-236). Hillsdale, NJ: Erlbaum. Hiltz, S.R. & Turoff, M. (2002). What makes learning effective? Communications of the ACM, 45 (4), 56-59. Hogan, K. (1999). Relating students’ personal frameworks for science learning to their cognition in collaborative contexts. Science Education, 83, 1-32. Honebein, P.C. (1996). Seven goals for the design of constructivist learning environments. In B.G. Wilson (Ed. ), Constructivist learning environments: Case studies in instructional design. Englewood Cliffs NJ: Educational Technology Publications. Jacobson, R. (1998). Teachers improving learning using metacognition with self-monitoring learning strategies. Education, 118(4), 579-589. Jegede, O. J. (2002). Facilitating and sustaining interest through an on-line distance peer-tutoring system in a cooperative learning environment. Virtual University Gazette, 35- 45. Johnson, D.W., & Johnson, R.T. (1989). Cooperation and competition: Theory and research. Edina, MN: Interaction Book Company. Jonassen, D.H. (1994). Thinking technology: Toward a constructivist view of instructional design. Educational Technology, 30(9), 34-37. Jonassen, D.H., Peck, K.L., & Wilson, B.G. (1999). Learning with Technology: A Constructivist Perspective. Upper Saddle River, NJ: Prentice-Hall, Inc.
Kemery, E.R. (2000). Developing on-line collaboration. In A. Aggarwal (Ed. ), Web-based Learning and Teaching Technologies: Opportunities and Challenges (pp. 227-245). Hershey, PA: IDEA Group Publishing. Kennedy, M. M. (1991). Teaching Academic Subjects to Diverse Learners. Teachers College, Columbia University Press. Kochan, F. K. (2000). Models for enhancing the professional development for teachers: Overview and framework. In D. J. McIntyre and D. M. Byrd (Eds. ), Research on Effective Models for Teacher Education” Teacher Education Yearbook VIII (pp. 1 –9). Thousand Oaks, CA: Corwin Press, Inc.
Krippendorff, K. (1987). Association, agreement, and equity. Quality a nd Quantity, 21, 109-123. Lin, X. (2001). Designing Metacognitive activities. ETR&D , 49(2), 23-40. Mouza, C. (2003). Learning to Teach with New Technology: Implications on Professional Development. Journal of Research on Technology in Education, 35 (2), 272-289. Palincsar, A. S., & Brown, A. L. (1984). Reciprocal teaching of comprehension fostering and comprehension monitoring activities. Cognition and Instruction, 1, 117-175. Pramling, I. (1990). Learning to Learn. A Study of Swedish Preschool Children. New York: Springer Verlag. Roth, W.-M. (1998). Designing communities . Dordrecht, The Netherlands: Kluwer Academic Publishers. Rourke, L., & Anderson, T. (2004). Validity in Quantitative Content Analysis. Educational Technology, Research and Development, 52(1), 5-18. Sparks, D. & Hirsh, S. (2000). A National Plan for Improving Professional Development. Retrieved September 2, 2005, from http://www.nsdc.org/library/authors/NSDCPlan.cfm. Schoenfeld, A. H. (1987). What's all the fuss about metacognition? In A. H. Schoenfeld (Ed. ), Cognitive science and mathematics education (pp. 189-215). Hillsdale, NJ: Lawrence Erlbaum Associates. Schulz, B. (2003). Collaborative Learning in an Online Environment: Will it work for teacher training? Society for Information Technology and Teacher Education International Conference, Vol. 2003, Issue. 1, 2003, p p . 503-504. Sternberg, R. J. (1984). What should intelligence tests test? Implications for a triarchic theory of intelligence for intelligence testing. Educational Researcher, 13(1), 5-15. Vygotsky, L.S. (1978). Mind and society: The development of higher mental processes . Cambridge, MA: Harvard University Press.